a peculiar discoloration of body tissues caused by deposit of alkapton bodies as the result of a metabolic disorder. ocular ochronosis brown or gray discoloration of the sclera, sometimes involving also the conjunctivae and eyelids. A rare, autosomal recessive disease characterized by alkaptonuria with pigmentation of the cartilages and sometimes tissues such as muscle, epithelial cells, and dense connective tissue; may affect also the sclera, mucous membrane of the lips, and skin of the ears, face, and hands, and cause standing urine to be dark colored and contain pigmented casts; pigmentation is thought to result from oxidized homogentisic acid, and cartilage degeneration results in osteoarthritis, particularly of the spine. an inherited error of protein metabolism characterized by an accumulation of homogentisic acid, resulting in degenerative arthritis and brown-black pigment deposited in connective tissue and cartilage. It is often caused by alkaptonuria or poisoning with phenol. Bluish macules may be noted on the sclera, fingers, ears, nose, genitalia, buccal mucosa, and axillae. Urine color may be dark. See also alkaptonuria. 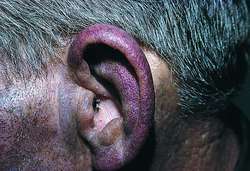 A condition observed in people with alkaptonuria, characterized by pigmentation of the cartilages; also may affect the sclerae, mucous membrane of the lips, and skin of the ears, face, and hands and may cause standing urine to be dark and contain pigmented casts; pigmentation results from oxidized homogentisic acid; cartilage degeneration results in osteoarthritis. Persistent joint disease associated with blue or brownish discoloration of the joint cartilages occurring in patients with ALKAPTONURIA. People with this rare hereditary condition tend to develop arthritis in adulthood. n condition marked by accumulation of black-brown pigment in cartilage, joint capsules, and other connective tissues as a result of alkaptonuria, which is a metabolic disorder resulting in accumulation of homogentisic acid. See also alkaptonuria. a yellow, brown or chocolate discoloration of cartilage, tendon sheaths and ligaments but not bone. Caused by deposit of alkapton bodies as the result of a metabolic disorder. Affected parts must be condemned as not suitable for human consumption. brown or gray discoloration of the sclera, sometimes involving also the conjunctivae and eyelids.